Background. 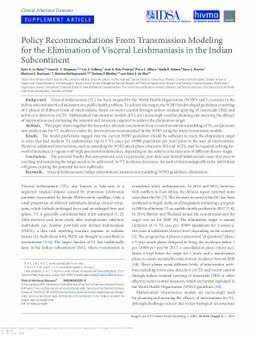 Visceral leishmaniasis (VL) has been targeted by the World Health Organization (WHO) and 5 countries in the Indian subcontinent for elimination as a public health problem. To achieve this target, the WHO has developed guidelines consisting of 4 phases of different levels of interventions, based on vector control through indoor residual spraying of insecticide (IRS) and active case detection (ACD). Mathematical transmission models of VL are increasingly used for planning and assessing the efficacy of interventions and evaluating the intensity and timescale required to achieve the elimination target. Methods. This paper draws together the key policy-relevant conclusions from recent transmission modeling of VL, and presents new predictions for VL incidence under the interventions recommended by the WHO using the latest transmission models. Results. The model predictions suggest that the current WHO guidelines should be sufficient to reach the elimination target in areas that had medium VL endemicities (up to 5 VL cases per 10 000 population per year) prior to the start of interventions. However, additional interventions, such as extending the WHO attack phase (intensive IRS and ACD), may be required to bring forward elimination in regions with high precontrol endemicities, depending on the relative infectiousness of different disease stages. Conclusions. The potential hurdle that asymptomatic and, in particular, post-kala-azar dermal leishmaniasis cases may pose to reaching and sustaining the target needs to be addressed. As VL incidence decreases, the pool of immunologically naive individuals will grow, creating the potential for new outbreaks.